This book of hours is illuminated in a style combining features typical of a group of manuscripts made in Suffolk, probably Bury St. Edmunds. Heraldry in one of the initials indicates that the manuscript was made for a member of the Hamelden family, of Holton St. Peter in Suffolk. This parish is on the outskirts of Halesworth, in an industrial estate where Bernard Matthews turkey products are made. 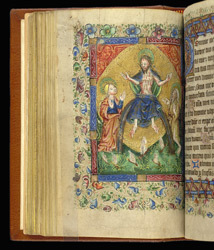 The Seven Penitential Psalms are illustrated with an unusual treatment of a common scene: Christ sits in Judgement on a rainbow, displaying his wounds; the Virgin Mary and St. John the Baptist stand to either side; and little figures, still in their burial shrouds tied above the head, arise from graves.